Well, mason jars have officially come a long way from your grandma’s stewed tomatoes. Now, people have started making amazingly cute gifts out of these classic jars. Here are several creative ideas to gift to someone special on any occasion. Mallory from Classy Clutter shows us how to spice up our gift giving. For a Bride to be, a Sweet 16, a simple gift for a best friend, this spa jar is sure to be a winner. Classy Clutter also has this great idea for the stressed out mom. New moms get very little sleep and need a “go-to” jar for all their needs. Having all these things in one location makes life less stressful. Tonia, from The Gunny Sack, is a lover of food and life. She thinks this would make a great gift for anyone in your life who loves them some tea! This idea is simply beautiful and a great way to say “welcome to the neighborhood”. This edible gift idea says that you care about the person you are giving it to. Jamie cooks this right up – homemade pancake mix. This mix keeps for up to 3 months in the jar and makes about 5 batches. Rebecca says that some people are difficult to buy for because they have everything. Why not give a cute, edible gift that’s sure to bring a smile? Melissa shows us how to make this adorable teacher-gift for the holiday. This is an inexpensive, cute way to say thank you to people you appreciate, yet can’t spring a lot of money for. The next time you have kids over for a campout or are going camping with other folks, you could hand these out as gifts for the bonfire you’re sure to have. Jamielyn said it’s pretty easy to “whip up” lots of these in a quick amount of time. If you have someone in your life who is interested in sewing, this small kit will be everything they need to get started. Malia has a great idea for Father’s Day or Dad’s birthday. She loves making things fast and cheap. Jessica used this for a teacher appreciation gift, but this would also be a great gift for a special man in your life. Holly hosted a guest on her site from The Gunny Sack. This date-in-a-jar is a creative way to spice up the fun and romance in your life. The author of Sweet Sugar Belle offers a great rainy day idea for you and the kids, or a great gift for someone in your life who has young kids. Going to a pool party or to someone’s house for a cook-out? Take one of these as your gift for the host! 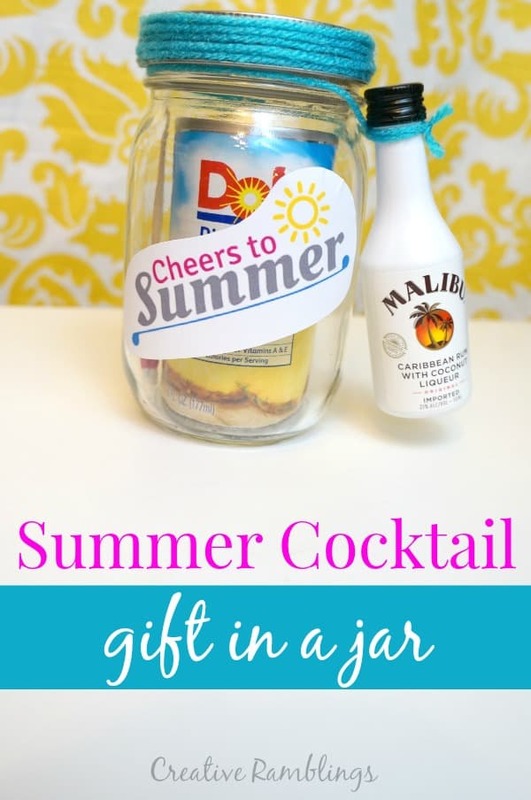 What a fun idea for the summer months. Since evergreens are always available, Stephanie says these candles are perfect any time of year. The herbs in them put off a nice nature-like smell, and these candles will make a great gift or a great centerpiece at a wedding. Jamie says this is a great sort of girlfriend gift idea for surviving the holidays. Jamie enjoys her annual girls’ weekend away, and surprises her friends with goody bags. This new idea, however, sure had everyone smiling. Angie spoils the kids in her life by making them these adorable sock puppet kits in a jar. What a cute idea! Each jar has enough stuff for the kids to make 3 sock puppets. In May and June, there are lots of graduation parties to attend. This idea is sure to be a hit. You can give little “diplomas” of rolled cash filling this jar. Jessica has a brilliant way to say thank you to someone in your life. This would make a great teacher-gift or Mother’s Day gift. Kimberly has some great ideas to show appreciation for teachers in the lives of your kids. This idea beats a real pencil any day. ​Check out the tutorial here. Teachers love apples, right? Well, let’s jazz up the apple gift this year by adding some tasty dip. Jennifer’s baby recently went to school for the first time. Typically teacher gifts come at Christmas or at the end of the year, but this idea is different. Why not bless a teacher in August with supplies that he/she will need? Jodi and Jen are expert teacher gift givers! They also know their Children’s Literature with the whole “Give a Mouse a Cookie” themed jar gift. Check it out! ​See the full tutorial here. I think we’ve pretty much covered every occasion. Which one are you going to put together for your next gift?